The tennis grips you use have a big influence on your style of play. This is because the tennis grip is one of the factors that determines how much of spin you put and how much of pace you generate. One grip is not better than another. You should select a grip that helps your style of play. 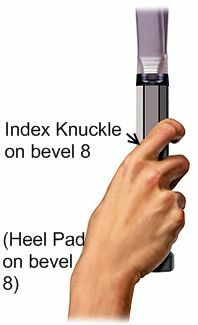 If you are an aggressive player, choose a grip that allows you to hit through the ball and put more pace (think Federer). If you are more of a consistent player, choose a grip that allows you to put more spin (think Nadal). 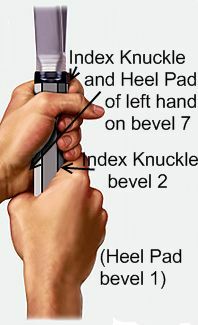 The tennis racket grip is divided into 8 bevels as shown in the diagram. 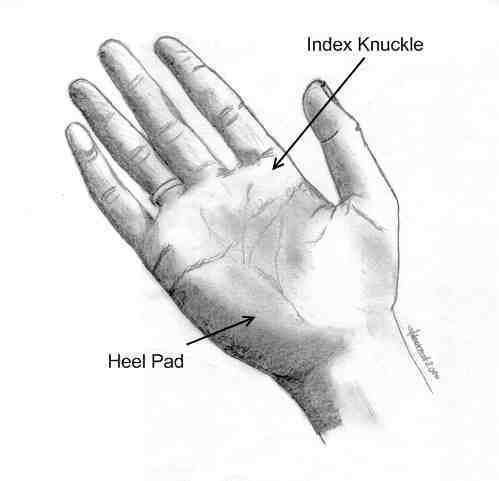 The type of grip depends on which bevel the Index Knuckle and Heel Pad rest. 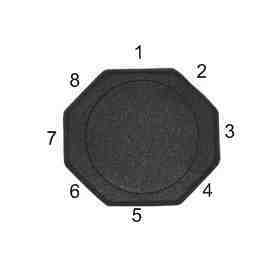 All of the tennis grip diagrams below assume that you are right handed. If you are left handed just reverse the instructions. Use this for the serve, volley, overhead, and slice (all the pros do). 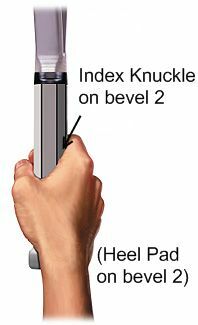 The Index Knuckle and Heel Pad rest on bevel 2. There are three forehand grips. 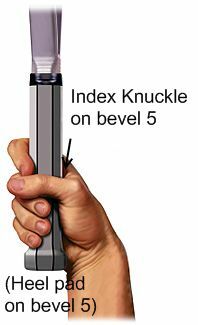 Each grip has its own natural height at which you would contact the ball. The higher the natural contact point, the more naturally you hit across the back of the ball from bottom to top, and more top spin you put on the ball at the expense of pace. This will be clearer as you read about the three forehand grips. Index Knuckle and Heel Pad rest on the 3rd bevel. Short cut to find this grip is to hold the racket at the throat with your non playing hand and use your playing hand to shake hands with the grip. Natural contact point is about the waist. You can hit the ball flatter than with a Western or Semi-Western Forehand Grip. But you will not be able to put as much spin. Roger Federer who has one of the best forehands in the game uses an Eastern Forehand Grip. Index Knuckle and Heel Pad on bevel 4. Short cut to find this grip is to put the racket face flat on the ground and to pick it up. Natural contact point is between waist and shoulders. You can hit with speed and spin. But not as much speed as with an Eastern Forehand Grip and not as much spin as with a Western Forehand Grip. Index Knuckle and Heel Pad on bevel 5. Natural contact point is by the shoulders. You can hit with more top spin than with any other grip. But cannot hit the ball with speed as in other forehand tennis grips. Some players use both hands for the backhand. Others use one hand. We do not think that you can definitely say that using one hand for the backhand is better than using both hands or vice versa. Two hands give you more stability on the backhand and in general is easier to master. The one handed backhand gives you more reach. Currently most top players use a two handed backhand grip. 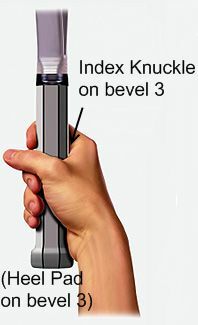 Right hand at the bottom of the grip. Left hand higher on the grip. 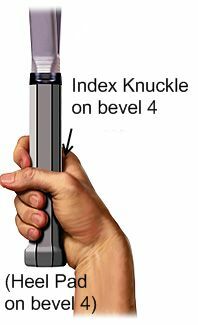 The Index Knuckle of the right hand is on bevel 2. 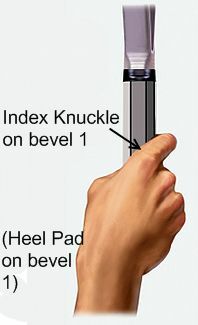 The Heel Pad of the right hand is on bevel 1. Index Knuckle and Heel Pad of left hand on bevel 7. Index Knuckle and Heel Pad are placed on bevel 1. This grip gives you more power but less top spin than an Extreme or Semi-Western Backhand Grip. Index Knuckle and Heel Pad are placed on bevel 8. This grip is difficult to master than the Eastern Backhand Grip. This enables you to put less power but more top spin than the Eastern Backhand Grip. Out of the backhand tennis grips this is the grip that is used the least by pros. As an exception Justin Henin who has one of the best backhands in women’s tennis.